Immerse yourself in this emerald magic panorama of Roberts Lakes Strand in Big Cypress. CLICK for zoomable panoramic. Try it on your iPhone!! Hiking through a cypress forest along the Florida Trail in Big Cypress. CLICK for fun zoomable panoramic. Try it on your iPhone!! This is one of those hikes you keep hearing really good things about, until you finally do it. Then afterwards you thank your best lucky stars for having had the privilege of experiencing one of the most beautiful spots in all of Big Cypress National Preserve! The Park Service offers Ranger led programs and hikes in season (Winter 2013 – Spring 2014), but this trip was organized by prolific hiker Christopher Scott Boykin working with the Big Cypress Chapter of the Florida Trails Association. Chris does several hikes a month and has been very active in getting new faces out in the wild to see South Florida’s natural beauty first hand! More information and pics can be found on the faceBook page Hiking the Florida Trail in Big Cypress. 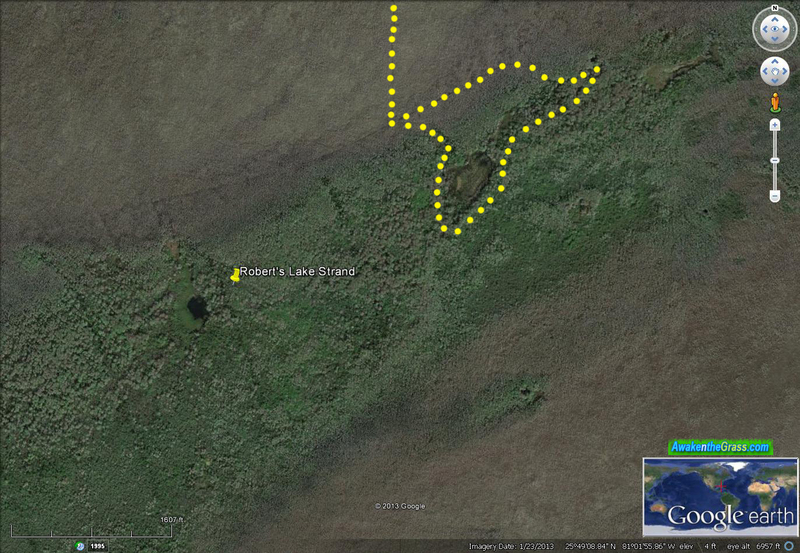 Roberts Lake Strand in relation to Big Cypress National Preserve. Roberts Lake is a small lake or gator hole inside Roberts Lakes Strand, a good sized growth of wild Cypress Trees about three miles south of Tamiami Trail (Hwy 41). There are actually several lakes in the Roberts Strand which appears to be named after one of the pioneering “cracker” families in SW Florida, the Roberts cattle ranching family. The trail head actually starts on the south side, directly across the street from the Oasis Visitor Center in Big Cypress. Watch for traffic crossing the road! It’s in a wet section of the preserve between the Hwy 41 and Loop Road to the south, called the “Loop Unit” as administered by the Park Service and FWC. 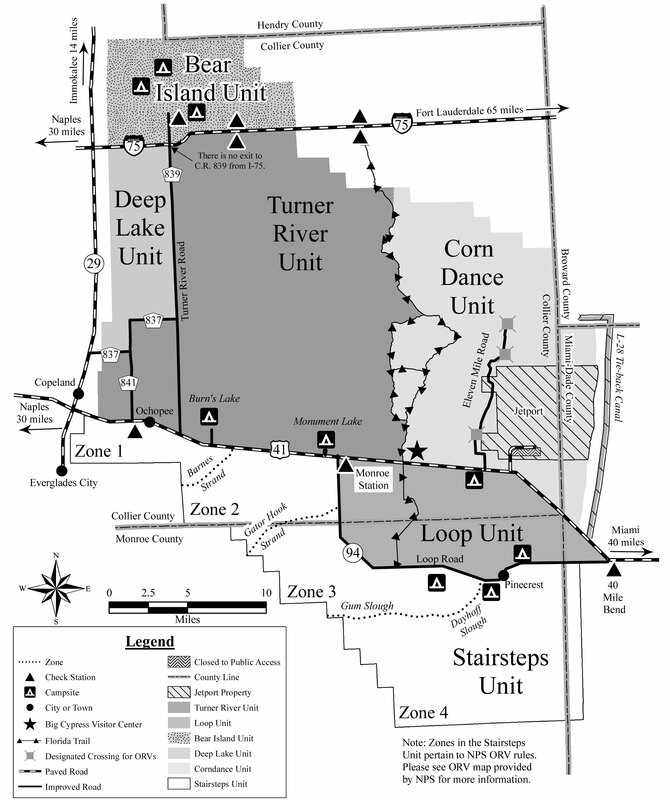 Approximate hike route along the Florida Trail in Big Cypress. Total distance covered was about 6 – 8 miles of mud! 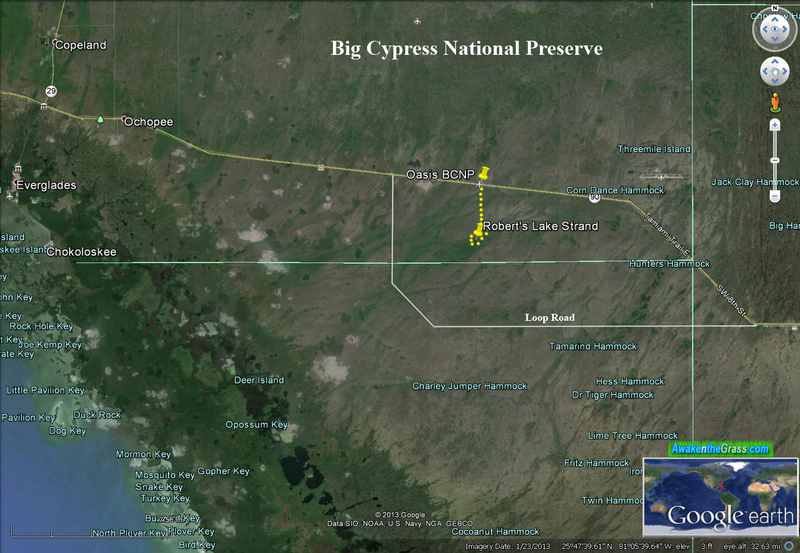 CLICK for detailed Big Cypress Map! The trip starts under the late moonlight, driving out to Big Cypress into daybreak. The beautiful early morning light makes up for getting up hours before sunrise! Sweet copper-hued early morning light along the trail to Roberts Lake Strand in Big Cypress. Hiking due south to Roberts Lake, the water and muck feel quite cool on the feet this early AM! The hike is along a straight trail that runs due south through two miles of Dwarf Cypress forest, and many of the trees are only 3 – 5 feet tall. At over 6 feet tall, I felt like some kind of a giant walking through this dwarfed forest. Of course, the aerial perspective below dwarfs everything! A line up in Big Cypress along the Roberts Lake trail, aerial crow’s eye view. A very small baby Cottonmouth (Water Moccasin) on the edge of the trail. There are many snakes out here, but we only came across two very young specimens. This could be his older cousin, also along the path! In March, terrain along the trail alternated between flooded out and deeper soft mud muck. Walking through chocolate brown muddy water can be tricky because of possible hidden solution holes in the limestone beneath. These “unexpected” holes can wreak havoc upon the ankles! Deep, soft muck mud makes for tough going in spots! A wildflower along the Roberts Lake trail. There is a lush explosion of vegetation variety upon entering Roberts Strand. Once inside Roberts Lakes Strand, the Dwarf Cypress forest gives way to lush sub-tropical foliage, an emerald Eden of greenery! Our trail inside Roberts Lake Strand. On Roberts Knoll, a small dry mound a few feet above the water. Towards the north east tip of the strand, is a mound of dry ground called Roberts Knoll. It’s among the very few places here that you can actually sit down on dry ground. Woodpecker’s eye view of Roberts Knoll in Big Cypress. A fine bottle of Saint Somewhere, a Belgian Ale was passed around. Roberts Lake Strand has a strong Jurassic-like feel to it! Wading into Roberts Lakes Strand. Hiking through the strand, wading through very clean water sometimes up to knee deep or more. This is a very rich biological area. We spotted a couple of Barred Owls in the tall Cypress trees. We are being watched here, by a couple of Barred Owls! CLICK for zoomable panoramic.Try it on your iPhone!! Observing an owl up in the trees. Jurassic hiking among tall ferns, many Epiphytes, Pond Apples, Pond Cypress and a few old growth trees that escaped the loggers’ saws back in the day. Lush emerald Eden that is Roberts Lakes Strand! A few of the “Giants”, the few old growth large Bald Cypress trees that escaped logging. Walking through this wet lushness we are now among the last “giants”, the few virgin old growth Bald Cypress trees that somehow escaped the extensive logging which took place here in the first half of the 20th century. Cypress trees are the largest trees in the South and typically live 400 to 700 years, topping out to 140 feet high and up to 17 feet in diameter! The wood is easy to work with, yet is very durable and highly resistant to rot and decay. Native Americans used it for their dugout canoes. In modern times, intense logging from the 1880s up to about 1950 has cleared almost all the virgin old growth strands. 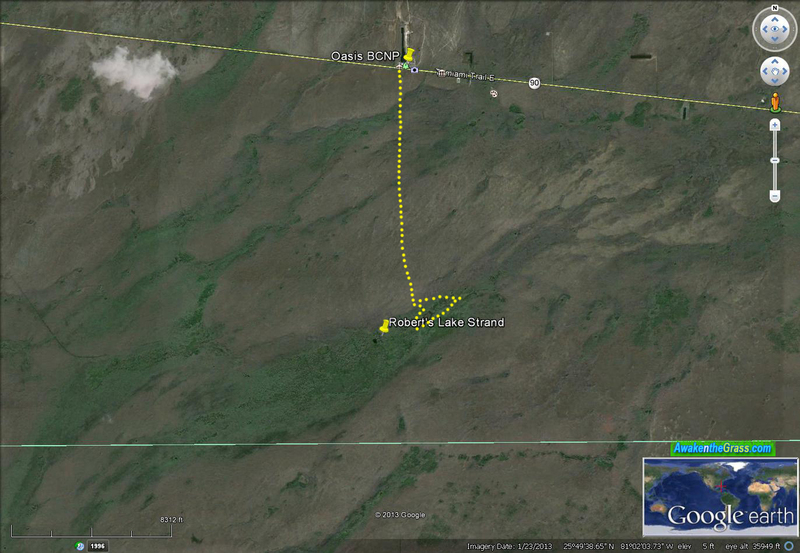 Roberts Lakes Strand is one of the few exceptions, and the main reason is probably that it was just too hard to get to! Of course these trees are nowhere near the size of the super giants such as the “Senator” above. Sadly it burned down in 2012. It was estimated to have been 3500 years old. Giant Cypress trees circa early 1900’s. Logging was and always will be damn hard work. 84 inch saw blade. That’s 7 feet in diameter! Logging in Big Cypress circa 1948 in Copeland, not too far away just down the road. There may still be a few trees out there so old, that they’ve lived alongside most of written human history. Pleased to meet you! Wading in towards Roberts Lake. Exploring the green magic wonderland of Roberts Lakes Strand. There is no well defined shore to Roberts Lake, the water just gets deeper as you get closer. It’s not stagnant and smells very clean and fresh! First look at Roberts Lake. Hikers immersed in the beauty of Roberts Lake! Aerial Owl’s eye view of Roberts Lake in Big Cypress. Roberts Lake is truly an emerald garden of Eden draped with curtains of Spanish Moss!! Wading along the lush “perimeter” of Roberts Lake. Walking over an emerald carpet along Roberts Lake. Emerald panorama in Big Cypress. There were only a few alligators way out in the lake, water levels have been higher than usual for this time of year. In drier seasons, the lake shrinks a bit and the gators can put on quite a show as in this excellent video (fast forward past second half). Perhaps another time! From the treetops – the group poses with Spanish Moss at Roberts Lake (below). Another aerial view of hikers along Roberts Lake draped by Spanish Moss. Making our way back to the trail in the garden of Eden at Roberts Lakes Strand. Cypress leaves in the strand. Hiking back along the Florida Trail through the cypress forest. In the Florida afternoon, the Dwarf Cypress forest gets hot and humid, yet still yields a few surprises along the way. The “Weeping Burl” in Big Cypress. “Blinded by the Light” in the Big Cypress! Big Cypress has gone through a lot of changes, especially in the first half of the 20th century. In 1974 it became the first National Preserve and was created with the combined efforts of environmentalists, hunters, conservationists, ORV users, hikers and others who wanted this land set aside to be protected. Prior to the Preserve, a giant international airport was already being built (a training runway is still in use to this day). Land owners and developers had plans to pretty much pave over from coast to coast in South Florida, and surely they could have done it had the Preserve not been established! Due to it’s geography and generally higher elevation, Big Cypress hasn’t been nearly as effected by human activities and misdeeds as the diminished Everglades to the east and south. Aerial photograph from 1942 shows Big Cypress and the Tamiami Trail (Hwy 41). Above & below, some things haven’t changed much thankfully! Big Cypress, aerial birds-eye view along the Florida Trail in March 2014. For more information if you’re interested in hiking, check out and become a member of the Florida Trail Association. In South Florida, the two chapters are the Happy Hoofers and the Big Cypress Chapter. There are also active Meetup.com groups. Enjoy the outdoors! Was followed up with a cold beer at Lucky’s (about 20 mins away on Loop Road).